Special Feature Why did millions of money-making post-holiday clicks suddenly disappear from the world's largest search engine? It depends on who you ask. Some people blame a soft economy, insisting that Google is well on its way to piddling quarterly revenues. But Google disagrees. CEO Eric Schmidt and company claim that they planned the whole thing - that this dip in paid clicks indicates that both Google and its advertisers are richer than ever. We'd like to tell you who's right and who's wrong. But that's impossible. Google's ad system is a riddle wrapped in a mystery inside an enigma. That's how Google likes it. 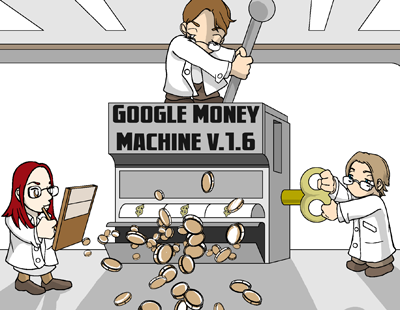 If you can't see inside Google's ad system, Google has the power to make more money. When the company says it's richer than ever before, it may be telling the truth. But it may be fudging the truth when it comes to advertisers - especially the small guys. On February 25, the online researchers at comScore unveiled a new report detailing Google's "paid click rate." According to the report, already the stuff of legend, seven per cent fewer people clicked on Google advertisements from December to January. Web pundits everywhere were sure that Google had fallen victim to an anemic economy, and the company's stock price took the requisite tumble, dropping almost 10 per cent over the next two days. Then comScore "clarified" its report, presenting the vanishing clicks as part of Google's master plan to improve the "quality" of ads and therefore increase revenue. Naturally, Google backed them up, telling everyone it's on a mission to eliminate "unintentional clicks." "Conversions actually go up for advertisers, which is positive, but there are less clicks overall," Tim Armstrong, Google's president of North America advertising and commerce, told MarketWatch. Believe it or not, comScore's Google-placating argument is at least partially true. In all likelihood, Google's first quarter numbers will look just fine. The company has far more control over revenues than the world realizes. The question is whether Google has too much control. The truth is that Google's commitment to quality ads goes only so far. Google isn't above boosting revenues at the expense of advertisers - particularly the small and inexperienced kind. The company can afford to do so. It controls almost 60 per cent of the search market. Late last month, just as comScore's report hit the web, Google sent an email to at least a few members of its flagship adverting program, AdWords. With AdWords, online businesses can arrange for their very own ads to appear in response to keyword searches. The program is billed as "an auction." If a business bids high enough, its ad will appear each time someone searches on a particular term, or collection of terms. And each time someone clicks on the ad, the business pays Google somewhere south of its bid - until the campaign reaches a daily budget. Of course, there are days when a campaign doesn't reach its daily budget, when an ad receives fewer clicks than normal. And that's where Google's late February email comes into play. The email notified certain AdWords users that Google was tweaking their ad campaigns to include something called "automatic matching." With this AdWords "feature," Google automatically grabs an advertiser's excess budget and uses it to post ads against keywords other than those the advertiser is actually bidding on. "Automatic Matching automatically extends your campaign's reach by using surplus budget to serve your ads on relevant search queries that are not already triggered by your keyword lists," Google's email reads. "For example, if you sold Adidas shoes on your website, Automatic Matching would automatically crawl your landing page and target your campaigns to queries such as 'shoes,' 'adidas,' 'athletic,' etc., and less obvious ones such as 'slippers' that our system has determined will benefit you and likely lead to a conversion on your site." In other words, Google will automatically take the money an advertiser isn't spending and spend it on searches the advertiser hasn't explicitly approved. For the average advertiser, this is not a good idea.